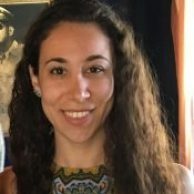 As Membership & Outreach Associate, I work on WCF’s communications, marketing, and member relations based in our Washington, D.C., USA office, far away from countries where cocoa is produced. 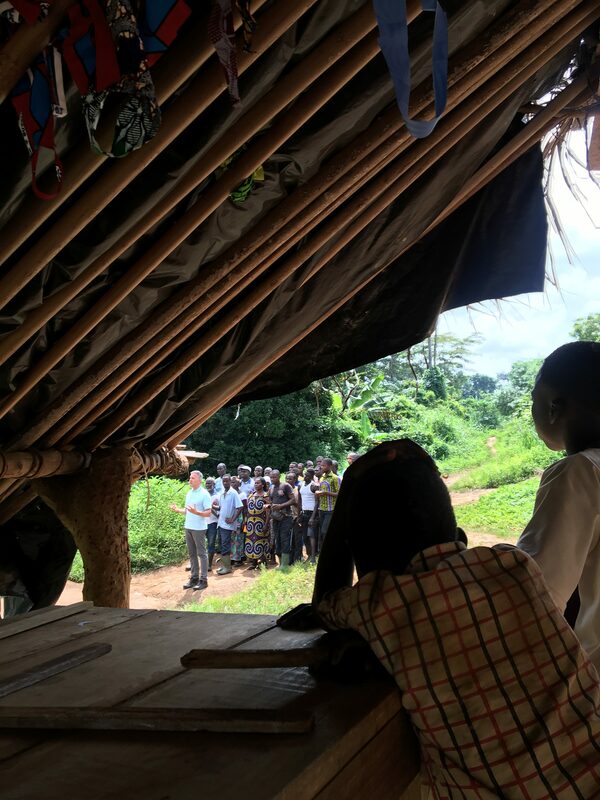 But in July 2018 I had the opportunity to visit Côte d’Ivoire and Ghana – and Africa – for the first time. 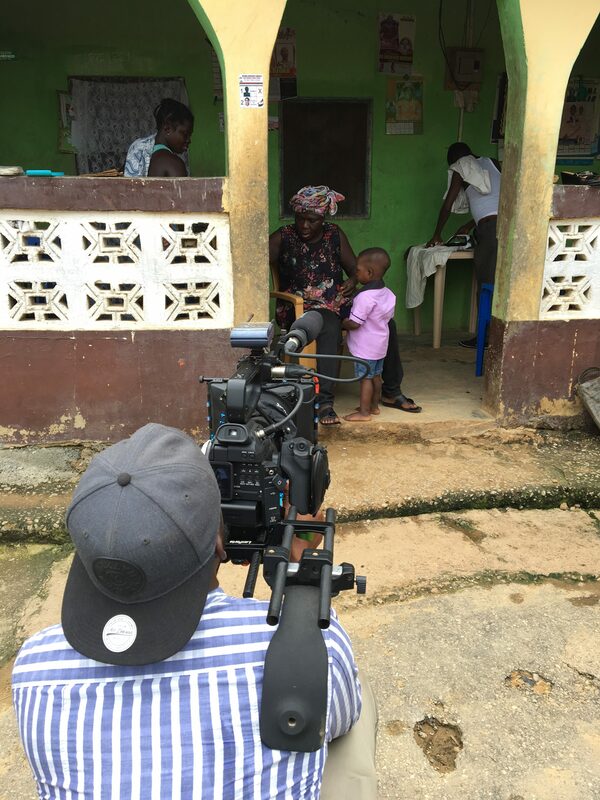 I spent two weeks in the two countries to attend the 2018 WCF Learning Meeting and 2018 CLCCG Annual Meetings, and, my favorite experience of all: spending six days in cocoa-growing communities to help film documentary-style videos about the lives and work of cocoa farmers. My trip into these communities started in the bustling city of Accra, and from there I traveled several hours through the Ghanaian countryside, making my way through the Greater Accra, Eastern, and Ashanti regions, before visiting communities in West Akyem (~75km northwest of Accra), Bekwai (~35km south of Kumasi), and Suhum (~65km north of Accra). 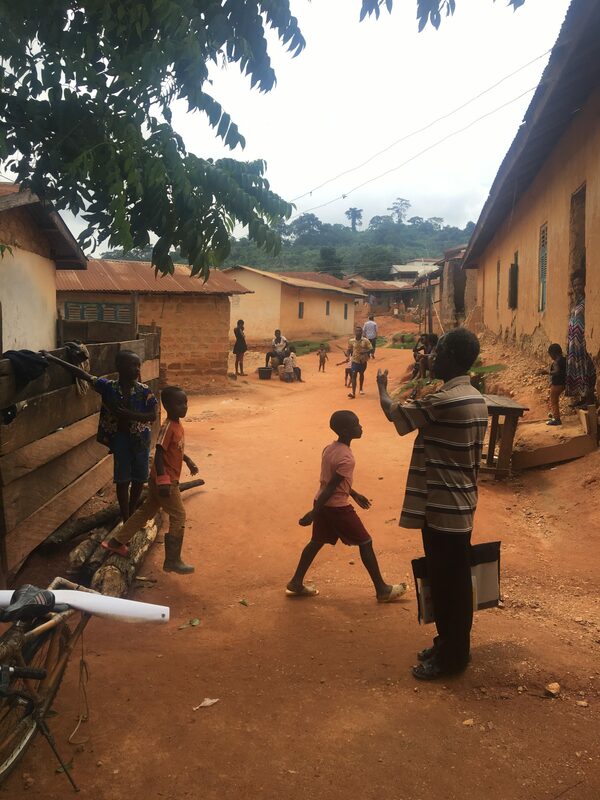 Walking into a Ghanaian village for the first time was a sensory overload, packed with images of orange-brown roads, lush greenery, and white-grey skies that threatened rain. For the first time in my life, I watched people go about their days drying rice or cocoa, fetching water from a well, head-carrying various items, sitting and talking to friends and family, and undertaking myriad other activities. It was almost as though I had walked into one of the many photographs I’d seen while sitting behind my desk at WCF’s offices in Washington. 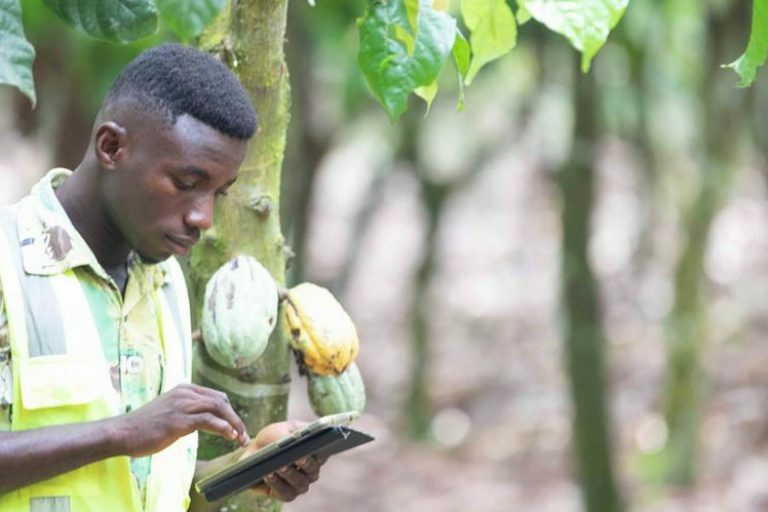 A few days later, I was in Côte d’Ivoire, the world’s leading producer of cocoa. From the country’s commercial capital, Abidjan, I departed westward toward the cocoa-growing communities of Gagore, Gazolilie, and Petit Toumodi in the Lakota (~225km from Abidjan) and Gagnoa (~52km northwest of Lakota) regions. 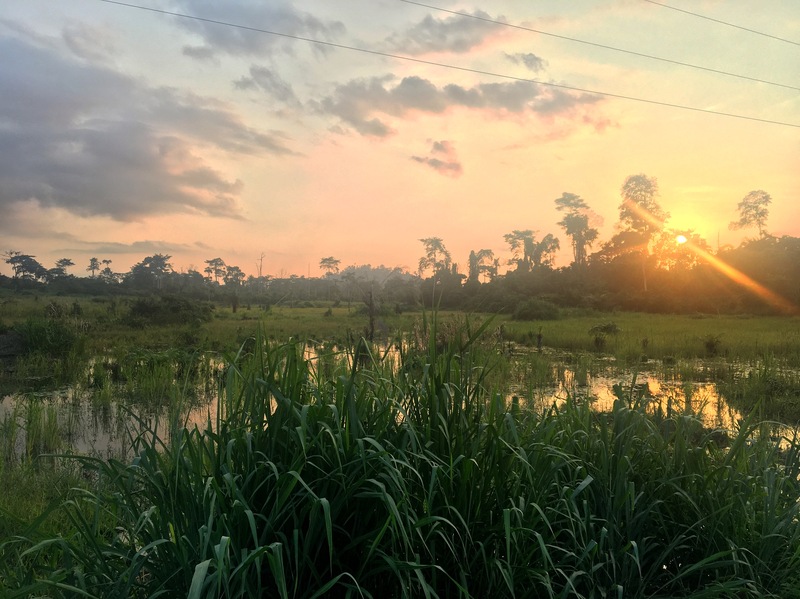 The Ivorian countryside looked somewhat similar to that of Ghana’s, and I was struck by how the the flag of Côte d’Ivoire, with its swaths of orange, white, and green, mirror the colors of the countryside. In each village, my team and I arrived in a minivan. I was traveling with the Ghana-based film crew (Cornelius and Kelly), field guides (Ignatius and Francis in Ghana, Jean Jacques in Côte d’Ivoire), driver (Ernest), and WCF staff (me in Ghana and Côte d’Ivoire and WCF Vice President for Member & External Relations, Tim McCoy in Côte d’Ivoire). Our arrival always drew the attention of many people in the communities, and especially the kids. More than a few would linger with us throughout our filming process as observers. Each visit would begin by paying our respect to the local village chief and other prominent community members. We would later greet the interviewees and explain, often through interpreters, the objectives of our visit. Locally-based WCF member company teams were tremendously helpful in this process. Cornelius and Kelly filmed community settings and the farmers at work before conducting one-on-one interviews with a few farmers. 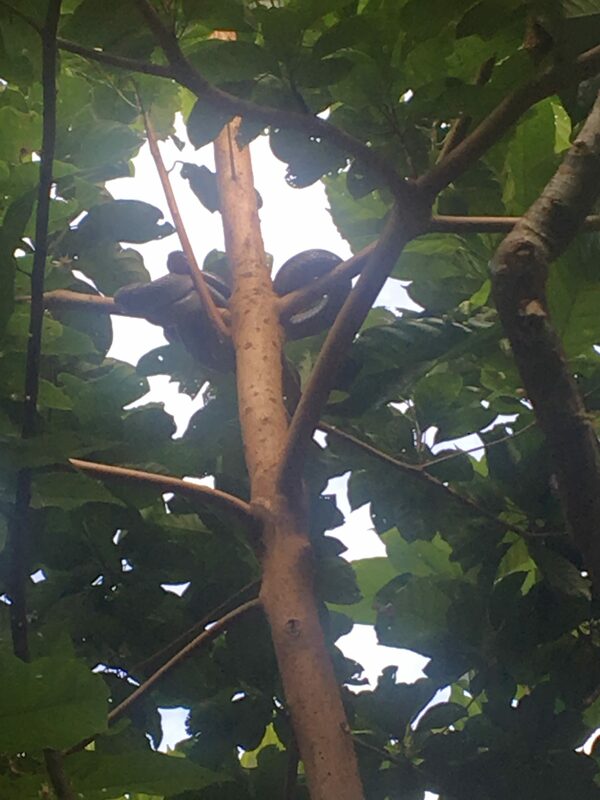 The film crew went to great lengths to capture scenes of farmers demonstrating what a normal day in the community is like, from getting their kids ready for school to sharpening machetes, and from preparing for the work day to pruning cocoa trees. The interviewees were patient with our team as they were asked to repeat and re-describe anecdotes and answers to questions in an effort to capture their most genuine voices. We heard from farmers young and old, male and female, to gain insights on a variety of farming backgrounds and experiences. Each person in each community had something new and different to share. 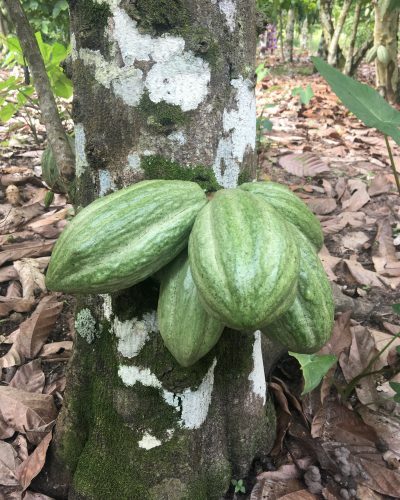 We learned about day to day work on the farm, their families, difficulties and challenges, successes, support from cocoa companies, alternative livelihoods, good agricultural practices, issues with pests and diseases, child labor remediation systems, the effects of a changing climate, and more. 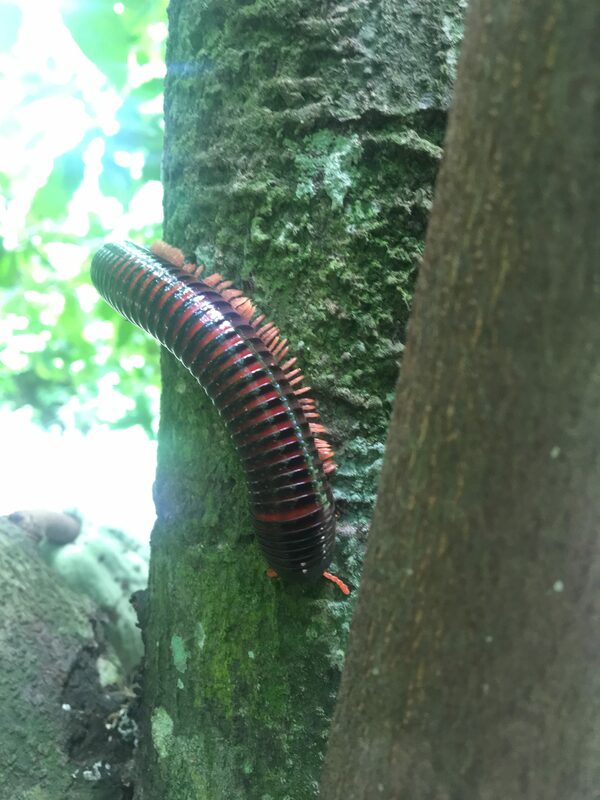 While my main role was to coordinate the video project, I also had the awesome opportunity to simply be in a cocoa-producing landscape for the first time. 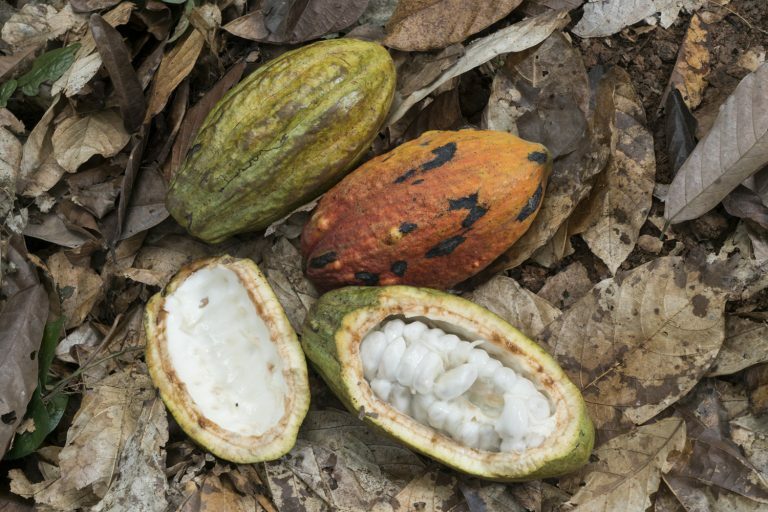 Cocoa trees look particularly whimsical to me, with cartoonish pods in green, yellow, orange, and red sprouting out of the sides of tree trunks. Despite having seen many photos, videos, and even individual cocoa pods in-person, the sight of rows and rows of these Seussian trees was striking and quite memorable. 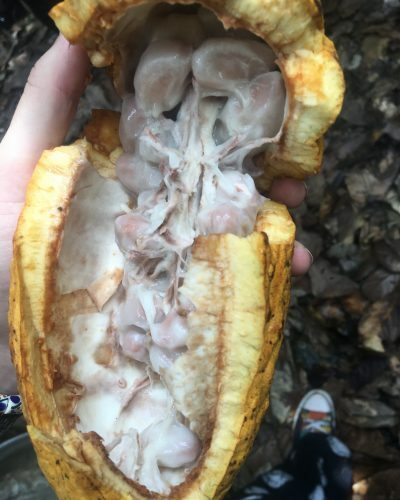 On the farm I visited in Bekwai, Ghana, we broke open a ripe cocoa pod to taste its fleshy pulp. I wasn’t sure what to expect, but the very sweet, fruity taste (nothing like “cocoa” as I know it) was an unexpected, pleasant surprise. 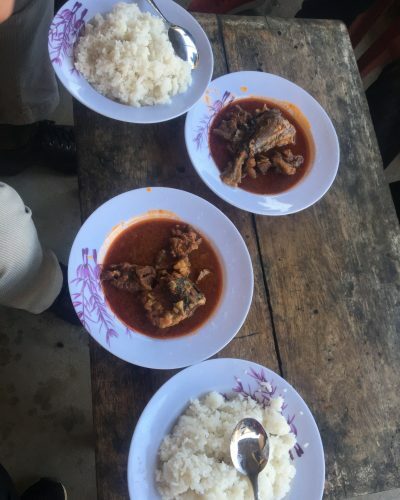 We were also invited to eat a meal of fish and beef stew with rice that had been home-cooked for us in the Gagore community in Côte d’Ivoire. After seeing groundnuts, palm oil, bananas, and rice among the goods grown around the villages, it was exciting to taste the absolutely delicious local rice, presumably if not from this exact village, from another one close by. Knowing that the meal was homemade for our team was also particularly sweet. 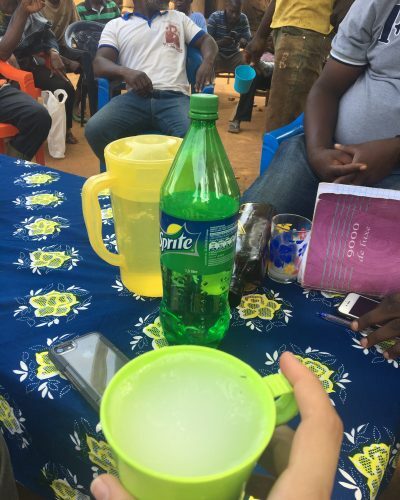 In the final village we visited, Petit Toumodi, Côte d’Ivoire, we were offered glasses of palm wine — another new taste unlike the wine I am familiar with — and toasted to the end of a great day of filming. Overall, my brief but action-packed two weeks in West Africa could be summed up as one of my most fascinating and special experiences. 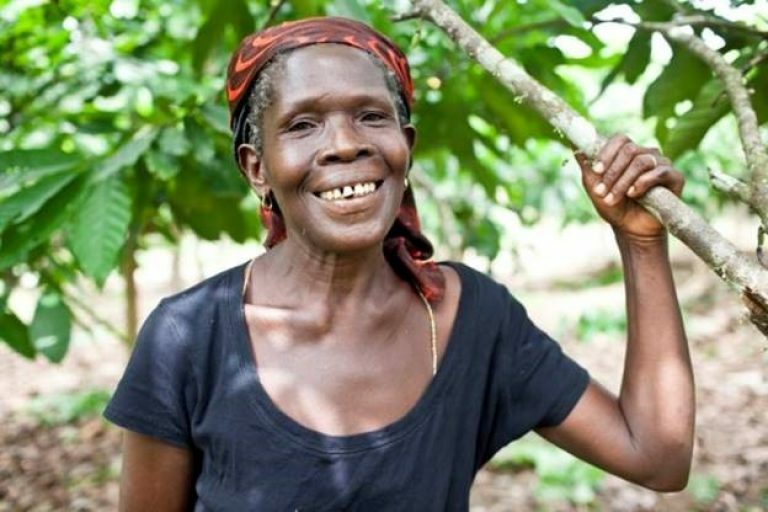 Stay tuned for the final “Cocoa Farmer Voices” videos, set to release in October 2018! *I would like to give a huge thank you to local staff at WCF members Blommer, Cocoanect, Mondelēz, Nestlé, and Touton, our WCF Accra and Abidjan teams, video team and field guides, as well as the incredibly gracious farmers and community members, who helped make the “cocoa farmer voices” video project a reality.